Abdullah was en route by train from Hijaz to Syria with armed forces to assist his brother Feisal in his struggle with France to retain power in Syria. Winston Churchill—at France’s request – offered Abdullah an Emirate in Transjordan—which Abdullah gratefully accepted on 11 April 1921. These British-Franco machinations cost the Jewish people dearly—when the Mandate for Palestine – adopted unanimously by all 51 members of the League of Nations on 24 July 1922 – denied the Jewish people the right to reconstitute the Jewish National Home in any part of Transjordan (Eastern Palestine) and restricted that right to the remaining 22% (Western Palestine). In 1948—immediately after the Mandate ended and Jews declared the State of Israel—Transjordan invaded Western Palestine conquering Judea, Samaria and East Jerusalem (comprising 4% of Mandatory Palestine)—and unified these areas with Transjordan to form a new territorial entity—Jordan—encompassing 82% of Mandatory Palestine completely devoid of Jews. The founding Palestine Liberation Organisation (PLO) Charter in 1964 specifically excluded any PLO claim to sovereignty in Judea and Samaria. In the 1967 Six Day War Israel captured Judea and Samaria from Jordan. The PLO – claiming Jordan and Israel to be one indivisible territorial unit – removed its non-claim to sovereignty from the revised 1968 Charter. Israel and Jordan signed a peace treaty in 1994 (Peace Treaty)—which has withstood many events that could have seen its termination. given the PLO 40% representation on the body charged with administering the Moslem Holy Sites in Jerusalem—breaching the Washington Declaration and the Peace Treaty. 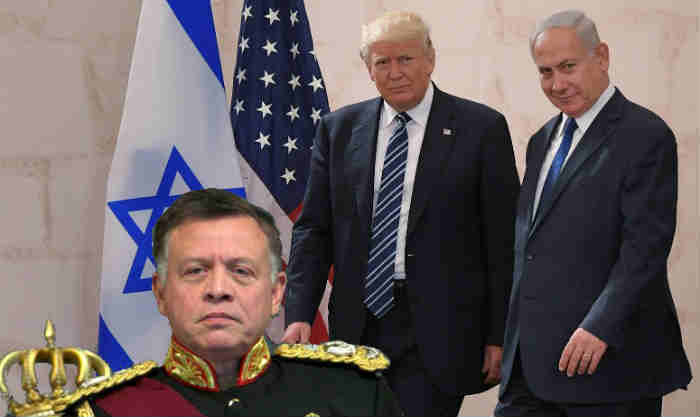 Jordan’s resistance to negotiating with Israel on Trump’s plan could see Trump shelving it and abruptly ending the 2018 five year $1.275 billion America‚ÄìJordan Memorandum of Understanding underpinning Jordan’s security and stability. The PLO—as in 1970—is waiting in the wings as current ongoing unrest in Jordan is destabilizing continuing Hashemite rule there. Abdullah might find that spurning Trump and Israel could see him facing the PLO on his own. This entry was posted on April 9, 2019 at 6:04 PM and is filed under Uncategorized. You can subscribe via RSS 2.0 feed to this post's comments. You can skip to the end and leave a response. Pinging is currently not allowed. Really now….can you blame him? His first obligation is to keep his head attached to his shoulders and avoiding life ending bullet wounds and bomb explosions. Never an easy job for a high living monarch in an otherwise impoverished country. All of the 22 Arab countries, prior to early 20th century, were either colonies of the ottoman empire or European powers or no man’s land comprising of insignificant chiefdoms, sheikhdoms, and desert dweller tribes and clans. None of them had a viable statehood status in history. Arabs owe their countries, covering an area of more than 13 million square km, to the generosity of the western powers. In other words, without exception, all of them are newly created fake countries, not to speak of their spoiled and corrupt ruling families and elites. They should finally come to their senses and admit that Israel is the oldest existing country in the world. moronic arabic/moslime proud sits in the way for coming to their senses . You know it, it is in their holy books, they are the best of the best and it shows , sarc off. By the way, would allah himself not be an epitome of sarcasm ?